Aircraft Interior is the best example for one of those perfectly engineered environments, where none of the products really work for the user. While the topics mobility and user centered design are becoming more and more important nowadays, aircraft interior stayed mostly the same over the last 40 years. Especially Economy Passengers still can't sit, eat, read or work properly. During the Master's Thesis, which the cabinBART concept comes from, in total over 80 passenger problems were identified and their correlations analyzed in a huge problem map. 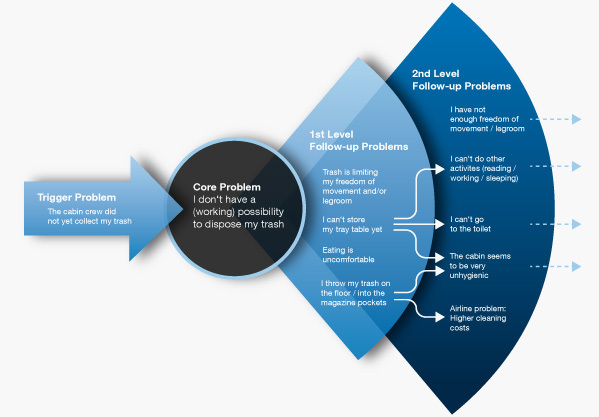 A cost-effort analysis on the determined problem fields showed, that creating a solution for the problem "I don't have a working possibility to dispose my trash" could prevent a lot of follow up problems with minimal effort, one of the main requirements for a product to be immediately implementable.